Salmon, Tots and Kale Bento, a photo by sherimiya ♥ on Flickr. Today's bento is filled with omega-3s, antioxidants, and high-energy foods to aid the brain activity of my kiddos: broiled salmon, kale chips, roasted potato tots, carrots, and a bunch o'berries including straw-, black- and blue-. Packed in the ultra-cute froggie two-tiered bento box and my vintage Keroppi folk from the 80s. Tomorrow is a big day for both of them: TinySprite has an interview for Kindergarten Readiness, and MisterMan is participating in the district-wide Spelling Bee. We're hoping there isn't too much in the way of dexterity tests for TS, seeing as how she's currently limited to a single arm. Luckily her dominant arm and hand are unaffected, so she can still write. If you hold the paper down. As for MM, he's reviewed the word list so many times I find myself using those words in my daily speech more than usual, and each time I do ("Look how regal the dog looks when he crosses his arms like that") I hear him spelling the word in the background ("R-e-g-a-l"). We're crossing our fingers they both do well tomorrow; so early bedtimes for them tonight it is! all the healthy stuff inside! First as always, Yenny, and with the nicest words for me. Thank you dearly! Great looking lunch here! Your kale chips look so wonderful, I love the idea of kale chips for a crunchy snack, but mine always come out super duper ugly!! I have to try your way!! Wishing big successes to TinySprite and MisterMan, "You can do it kids!!" Thanks berrygirl, but sadly the kale chips lose their crispiness in the bento. The kids still like them, but it's not the same as oven-fresh. I think it may keep in a zipperlock baggie, though I haven't tried. I find I have to dry the kale leaves absolutely completely, and then watch them in the oven constantly because they'll brown in an instant. Wishing them both good luck and hope they'll both ace the tests ! It won't be from lack of brainfood if something didn't work out as it should. You packed a delicious and very nutritious bento. So sweet; thank you Ceinwyn! So dear! Food for the brains, packed with love to the ♥ ^_^. Oh, and delicious too! I hope MM and TS will do fine with all the challenges on this weekend! They surely will, whatever the result. The kiddos will be always fighters and winners, no matter what :). Have a sweet weekend Sheri! L, you are always so supportive and encouraging!! I tried to be laidback and relaxed for them so they wouldn't be nervous, although of course I was the only nervous one. I love the salmon and curly kale- such a treat! Bright, brainy, buoyant bento! Happy weekend to you and yours, Sheri! Haha! Thank you for your thoughtful words as always Jenn. Appreciate it! You are totally welcome to make this lunch for *me*! This looks sooooooooooooooo yummy!! 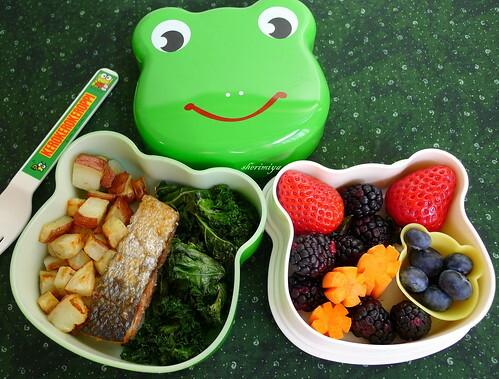 What a healthy looking bento and the froggy bento box looks adorable :)!! Love the froggy box! Looks great.